Field Trips broaden our perspective and give us a rest from Temple Building. The trip itself was interesting as we changed people in the vehicles along the way to get to know each other better. 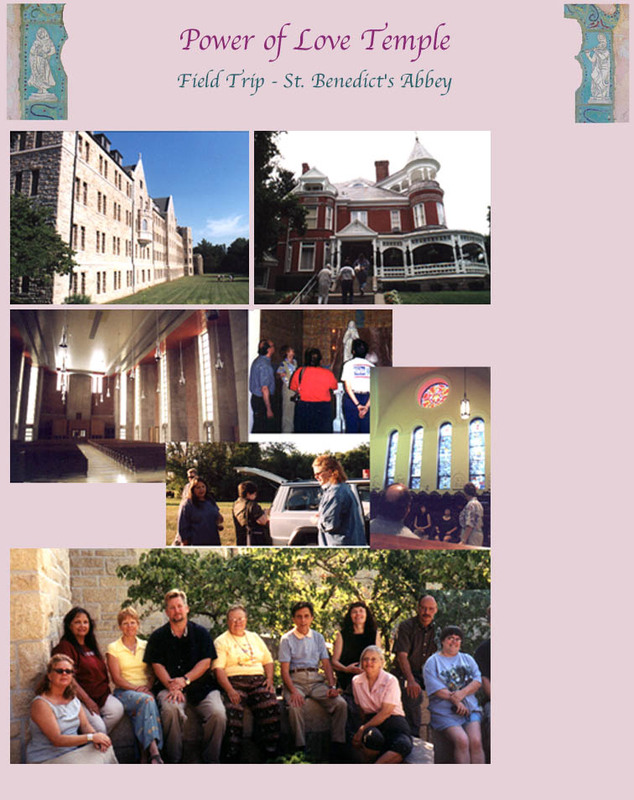 Our beloved Steve Kelley graduated from Benedictine College and proposed a field trip to see the college and the Abbey and other sites in Atchinson, Kansas. The photo on the upper right is Munchnic Museum. Our group of 10 had lunch there with Mrs. Kew, one of Steve's violin teachers. We spent the night in the Abbey Guesthouse (upper left). The Abbey has a beautiful chapel humbly attributed to the Frank Lloyd Wright school. Father Blaine was very warm and generous with his time with our group. We also visited Mount St. Scholastica and it's college campus. St. Scholastica was St. Benedict's Sister. The Sisters gave us a warm welcome, a tour, and answered our questions.